Caribbean Lifestyle Media-Reggae artistes Ieye and Alborosie recently collaborated on a new single titled, "surrender to your love". The song was produced by CLIFTON 'SPECIALIST' DILLON a.k.a THE STAR MAKER. Ieye released her new video "Mama Hands". Alborosie is known for his collaboration with a variety artiste and waving the flag for Roots, Rock, Reggae music in Italy. 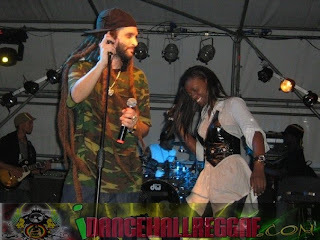 Most notable his collaboration with Etana gained traction on Reggae radio stations worldwide. Ieye who was profiled by sister site DancehallSoca , told us that in 10 years she saw herself "collecting Grammy's and platinum records", her consistency may just make those dreams come true. Her new single with Alborosie is below for your listening pleasure.